Published: Dec. 2, 2018 at 04:31 p.m. The Chicago Bears break out the famous "Philly Special" play to tie the game late in the fourth quarter. Published: Nov. 18, 2018 at 09:22 p.m.
Chicago Bears quarterback Mitch Trubisky rolls right and lofts pass to wide receiver Anthony Miller who dives for touchdown grab. 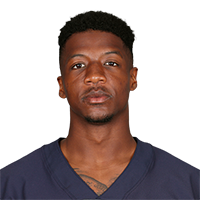 Published: Nov. 11, 2018 at 02:54 p.m.
Chicago Bears wide receiver Anthony Miller jukes a defender on a 55-yard catch-and-run.